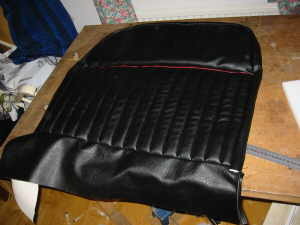 Vinyl interior, with some red welting. 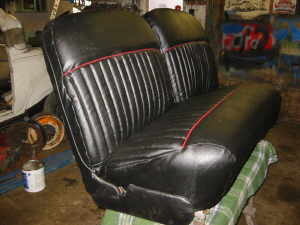 This is the before picture of the rear seat, quite nice but its not black. 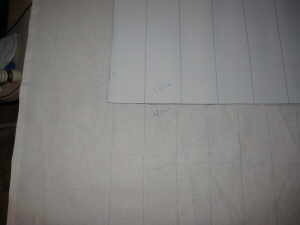 Since i wanted some tuck and roll pleats, i made up three strips, that i used when creating the "pockets. 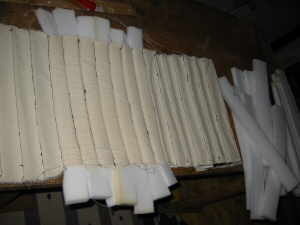 One 60 mm for the vinyl, One 50 mm for the backing cloth, one 40 mm for foam. 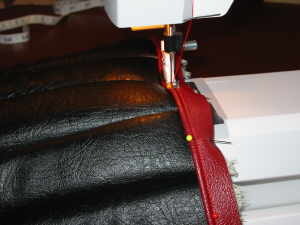 Here I'm sewing the pockets, using a Leather needle, and thick thread for buttons. 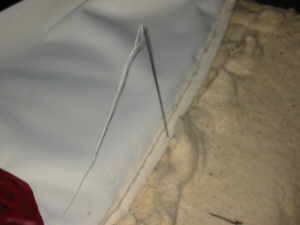 I've found the ordinary thread will cut the vinyl, because its so thin. 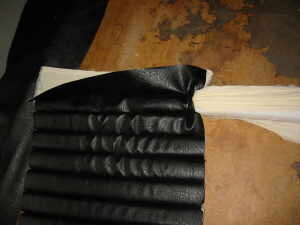 The important thing here is how the vinyl is folded. 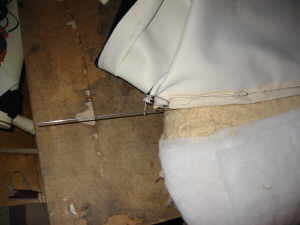 By doing it like this there will not being any stitches visible. 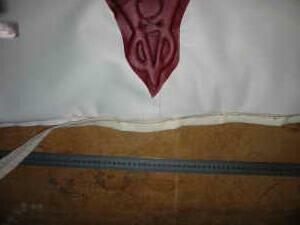 And everything is made on my wife's household sewing machine, nothing fancy. After sewing all pockets, you just have to stuff them. I made a "pocket" stuffer out of a strip of 50mm cotton cloth. 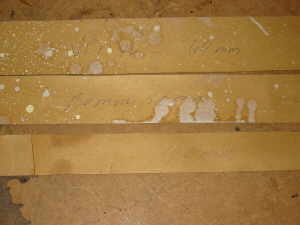 And using a long steel ruler to push with. 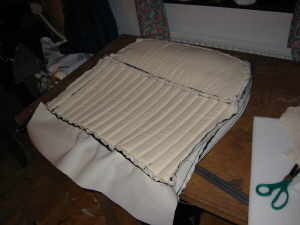 Finally fold the cotton over every thing, the cotton cloth is on the other side to. Then i just pushed the package into the pocket. It takes some training, but when you get the hang of it its easy. 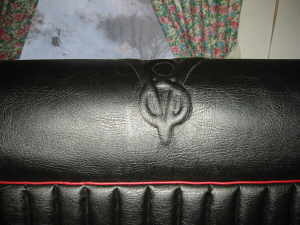 To make the rear seat a bit hotter i added the V8 logo in the center of the upper part. 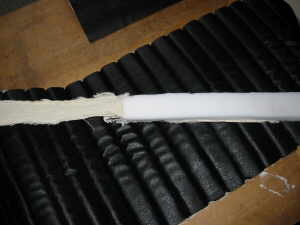 By putting a 6mm "Styrofoam" between to Vinyl sheets, the big one is the backseat part. And the red one was a spare bit i found. By doing this it creates a 3D feeling of the logo. 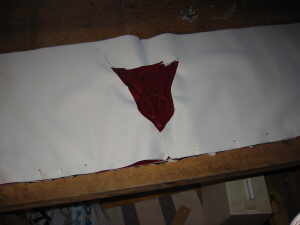 Then i added the red piping that i made by sewing in a clothes line into a folded red vinyl strip. 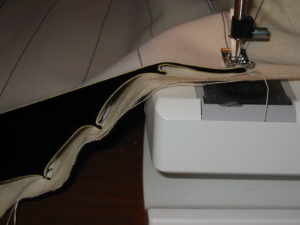 Then stitching it to the part i made before, Here you may help the sewing machine by pulling. 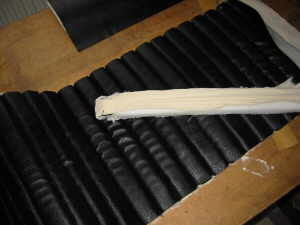 I also added a channel of cotton cloth, and then put some welding rod into that channel. 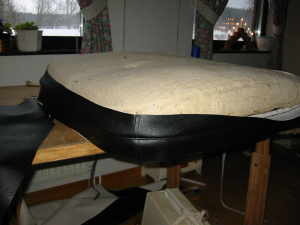 To be able to "sew" the dividing part into the seat. 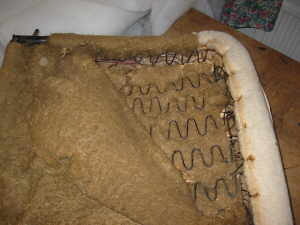 But before doing that i had to do some repair on the bottom spring seat . 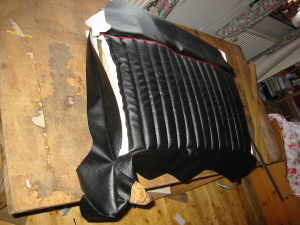 Here is the bottom part with the red piping mounted, ready to be sewn to the upper part. I also added some sides. 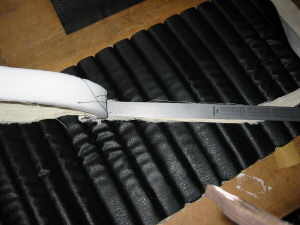 the pattern for this part was taken from the original brown vinyl parts. 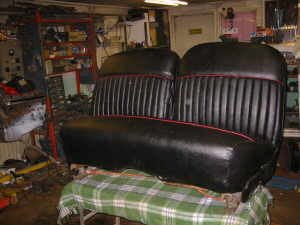 Then i mounted my new tuck n roll on the seat springs. 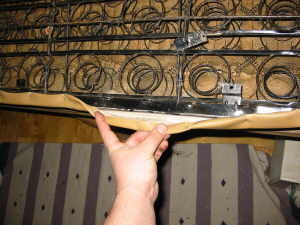 Using the old hog rings. Even the logo looks great. 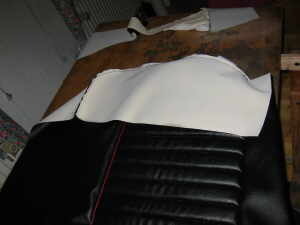 After the success with the rear seat, it was time for the front seat, to get some vinyl covering. 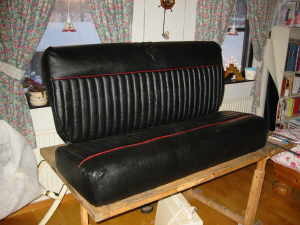 After removing the original cloth from the front back rest, i had to do some repairs. 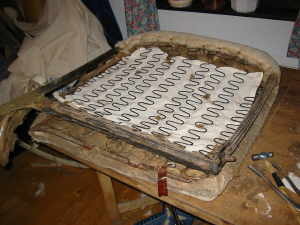 Adding some fresh cotton cloth. 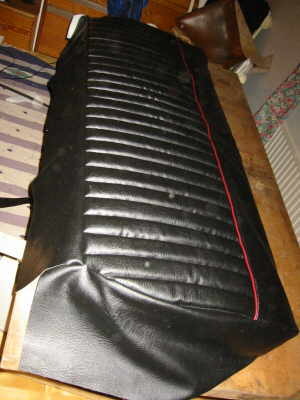 I used the original Ford seat cover as a pattern for the new vinyl covering. Testing as you go is good to do. 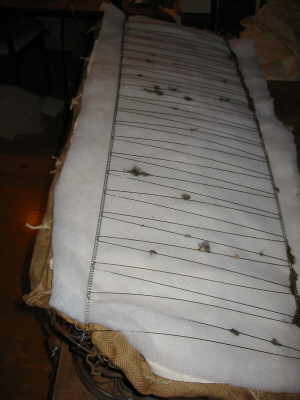 Then i stitched everything together outside in. 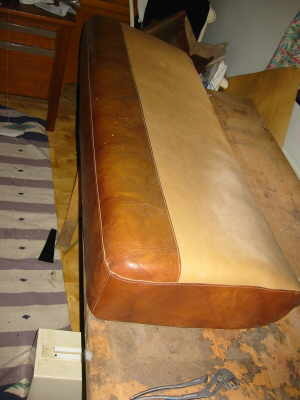 Ready to mount on the backrest. 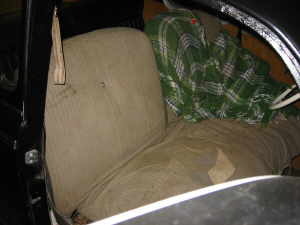 Its good to have a friend helping you pull the cover over the seat springs. Ready to mount in the car, looks a lot better doesn't it? 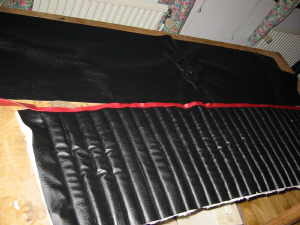 There is still some wrinkles to iron out, and its quite easy by using a hot air gun and pulling a bit.